LAS VEGAS (JTA ) — “Trump” was once a dirty word in this room. Eight years ago, in the same building — Sheldon Adelson’s Venetian casino resort, the site of the Republican Jewish Coalition’s annual conference — Mitt Romney was the presumptive 2012 Republican presidential nominee, and he made it clear he wanted nothing of the tactics of the reality TV star from New York. An RJC activist asked Romney if he would be less of a “gentleman” and maybe adopt the “scrappy” style of Donald Trump, who was eyeing a political future as ratings for “Celebrity Apprentice” were fading, and who raised specious questions about President Barack Obama’s citizenship. No, Romney said, he would not stoop to “innuendo” or even mention Trump’s name. It was an approach embraced by the RJC leadership, which went on to feed major money into Romney’s campaign. Saturday at the Venetian was a different story. 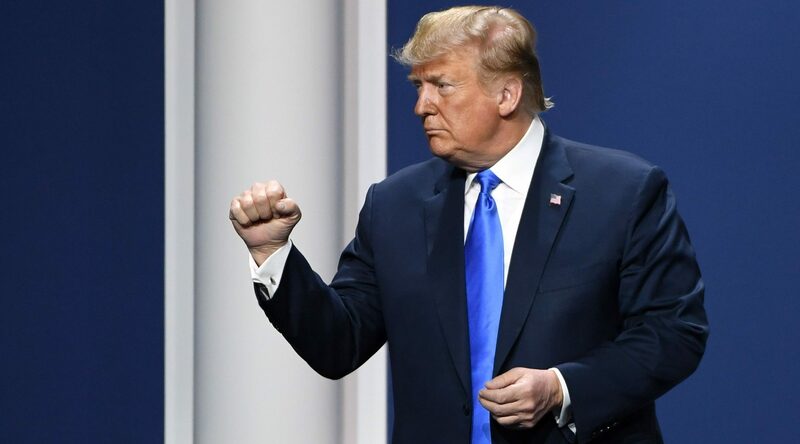 Trump, it is said, has remade the Republican Party in his image, and this weekend, in a hero’s welcome, he showed how much he had brought along the party’s once skeptical Jewish contingent. Both he and Vice President Mike Pence attended the conference to speak. There were still awkward moments during Trump’s speech that showed what divides many Republican Jews from Trump. But more evident was what has brought them together: Trump’s eager embrace of his advisers’ hawkish pro-Israel policies. “That guy who just said that — he used to hate me, can you believe it?” Trump responded, drawing laughs. Coleman then led the room in a parody of the Passover song “Dayenu” (“It would have been enough for us”) by listing Trump’s tax cuts and his Israel-related actions, including moving the U.S. Embassy to Jerusalem, recognizing Israeli sovereignty over the Golan Heights, pulling out of the Iran nuclear deal and defunding the Palestinians. Matt Brooks, the Republican group’s CEO, said Trump had earned the love in the room. But people in the room pushed back when Trump bizarrely assumed they vote Democratic, like the majority of the rest of American Jews. “How did you support President Obama, how did you support the Democrats?” Trump asked. “We didn’t,” the crowd replied, twice. There were other awkward moments during Trump’s speech. As he did in his last RJC appearance in 2015, Trump on multiple occasions unsettled the crowd when he appeared to address an amorphous Jewish collective with allegiance to Israeli Prime Minister Benjamin Netanyahu that once owned factories and influenced trade policy. He described his asylum policy as “we’re full,” an echo of the pre-World War II policies that kept desperate Jewish immigrants out of America. At least three additional times, Trump used the collective second person “you” in addressing the Jews in the room. “I stood with your prime minister at the White House to recognize Israeli sovereignty on the Golan Heights,” he said. That drew condemnation from the American Jewish Committee, the Anti-Defamation League and Jewish Democrats. A Democratic congresswoman, Rep. Ilhan Omar, D-Minn. — whom Trump mocked in his speech — has come under fire from Republicans and fellow Democrats for her perceived invocation of the dual loyalty trope. Trump also collectivized Jews as influential on trade policy in defending his introduction of tariffs. “Maybe you could explain that to some of your people who say ‘Oh, we don’t like tariffs,’” he said. And he seemed to imagine a room full of one-time captains of industry frustrated by the 1990s NAFTA free trade deal that he has reviled. “Many of you people have factory and plants, they’re still empty,” he said. The same generalizing of a sometimes hostile Jewish monolith cast a shadow over Trump’s first appearance before the RJC, at its 2015 presidential candidate forum. The remarks made many Jewish Republicans, already wary of Trump for his lack of experience and his biased statements about other minorities, even more skeptical of his chances at the time. Adelson waited until May 2016, when Trump’s nomination was all but certain, to board the Trump train and had to issue a public appeal to persuade fellow Jewish Republicans to join him. This time, Trump’s history of invoking the very tropes that got Omar into trouble — that Jews buy influence, and that they are dually loyal to Israel — got a pass at the RJC. Halie Soifer, who directs the Jewish Democratic Council of America, watched Trump’s speech on C-Span and was stunned not to see any pushback. “For them to decry anti-Semitism on the Democratic side when it was exactly the same references that they now applauded and welcomed back is baffling,” she told JTA. A source close to the RJC said that the leftward tilt of the Democrats, the rise of Israel-critical figures like Omar and Trump’s Netanyahu-friendly policies make backing Trump an easy choice, despite the discomfort at times. Notably, the RJC did not fill all the 1,500 seats in the room, even with bodies added from a social media call to Las Vegas-area Trump fans, Jewish and non-, to attend. A group that told JTA that they were Las Vegas Filipinos for Trump posed for photos in the conference hall, and some sported the red Trump kippahs that the RJC gave out. The event drew top-flight politicians who benefited from Adelson’s political backing, including Florida Gov. Ron DeSantis. Brooks showcased ad campaigns that he said helped elect Republicans. Ari Fleischer, an RJC board member, said he saw opportunities for more wins in 2020, especially in swing states with large Jewish populations like Florida and Ohio. Trump said the Democrats were the party of bias. “The Democrats have even allowed the terrible scourge of anti-Semitism to take root in their party and their country,” he said, referring to Omar. Omar was the absent star of the conference: Pence, House Minority Leader Rep. Kevin McCarthy of California and New York Rep. Lee Zeldin all referred to her at length. The RJC also screened a video that said anti-Semitism “is too often being led by the liberal wing of the Democratic Party.” It singled out Omar, showing her photo next to text saying “congressional leaders employing disgusting anti-semitic slur” and a photo of the Tree of Life synagogue complex in Pittsburgh where a gunman killed 11 Jewish worshippers in October. “The stakes could not be higher,” the narrator said. The alleged killer behind the Pittsburgh shooting was a white supremacist. Brooks told JTA that the RJC did not intend to attach Omar to the Pittsburgh killing, or to play down the white supremacist threat. But the threat posed by white supremacists barely rated a mention at the conference. Trump, after the recent mass murder of Muslims in New Zealand carried out by a white supremacist who frequented the same online forums as the alleged Pittsburgh killer, said he did not see white supremacism as a growing problem. At the end of his speech, Trump discussed the Pittsburgh shooting, but not the far-right extremism that fueled the violence. Jewish Democrats scoffed at attempts to tar their party as posing the greater threat to Jews. Rep. Adam Schiff, D-Calif., the Jewish chairman of the House Intelligence Committee, noted that Trump after the deadly 2017 neo-Nazi march in Charlottesville, Virginia, said there were “some very fine people” on both sides of that clash. “The president needs to look inward when it comes to the rise of anti-Semitism in the country,” Schiff told CNN. “Jews are here to stay, the occupation is a plague,” they said as security escorted them out of the room.